Sungazing is a powerful process that dates back to ancient Egypt. There is much evidence that points to the knowing that the Egyptians received downloads of Divine information from practicing Sun Gazing as light carries information. This could be described as letting in the light or being a light worker. When we start this practice our minds open clearly and we experience a wonderful enhancement of mood and well being that let’s us feel beneficial shifts are taking place, like a flower blossoming in the light. The sun has long been worshiped by ancient civilizations. The Incas, Egyptians, Aztecs, Greeks, Romans and many more knew the power of the great central sun and how the sun enlightens us. It is common to see ancient Egyptian art where the figures are gazing up at the sun with a knowing look. Obviously there are many who believe that looking into the sun at anytime can be dangerous. 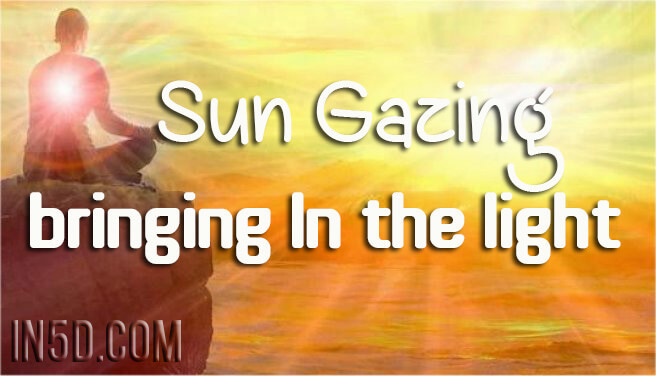 The practice of sun gazing has specific times we are aloud to look around the sun. We are told that the first hour of sun in the morning and the last hour of sun of the day, are safe times to do our sun gazing practice. I say “look around the sun” because after experimenting with the process, I do not give the suggestion to look directly into the sun. When I practice sun gazing I look at the rays coming from the sun or watch the sun through the leaves of trees for protection to my eyes and I get wonderful results. I find the tree and leaves also add a unique flavor to the experience. Each person is unique and must do what is best for them but I do not suggest direct watching. I think less is more in this case. We must each do our own research and listen to our bodies. Go slowly with the practice and listen to your body. A little sun gazing goes a long way. During the time where we are sun gazing we want to plant our bare feet directly on the earth, this gives the practice a big boost and more power. Going barefoot is a whole other beneficial practice as we are charged with the earth’s electromagnetic fields and balanced on all levels. When there is a headache, walking around outside barefoot is a great way to help soothe it. When they say “mother earth” we may become aware of her healing and loving gifts for us. It is our birthright to enjoy all her wonders and benefits. Enhanced vitamin D absorption. Vitamin D is wonderful for stronger bones and teeth and great for mood enhancement. We are all aware that sun deprivation during winter months is responsible for many cases of depression. When we practice safe sun gazing during winter months we can expect to alleviate the winter blues. The ability to heal and reactivate our pineal gland. The pineal glad will shrivel with age. The pineal gland is responsible for our enlightenment, creative abilities and connection to Divine Intelligence. Enhancing our pineal gland helps to waken us up and remember who we really are, sun Gods and Goddesses. The sun is a great analogy for how a highly evolved human could operate by radiating great energy and love to those around them. We may use the sun to help us radiate more love and light in our lives, as the sun is an unlimited supply of energy and light. Yes, the sun will come up tomorrow. Anytime we feel drained or out of sorts this is a great opportunity to meditate in nature and the sunlight to fill our cup back up. Nature will keep us balanced and happy, we simply want to remember to take time in her splendor. Nature is a wonderful counter balance for all the computers, cell phones, electric outlets, etc. It is interesting to note that the bosses in most businesses have offices with large widows, which bring in a lot of sunlight. Do these bosses subconsciously know that they are getting information from the sunlight? Whether they are aware of this fact or not, it is true that the sun radiating through the windows is giving them a huge advantage and boost. We don’t have to be the boss to benefit from the sun, everyday makes it a point to spend some quality time in the sun without any sunglasses on getting filled with love, light and vitamin D.
Hira Ratan Manek is one of the best-known sun gazers. He believes that the sun can be used to heal the mind, body and spirit. He explains that when we eat plants we are eating the energy of the sun. He states that we can get that energy directly from the sun without ingesting the plant, a human photosynthesis of sorts. Hira claims to have been living on sun energy, water and a few drinks for social occasions since June 18, 1995. He also says this has regenerated his brain and pineal gland. This is certainly “sun food” for thought. I have always found it suspect that we are told that the sun causes cancer. Toxic food and thoughts seem much more likely to do this. Surely moderate sun exposure has its place in a healthy life style. Of course all things in moderation, even moderation. The good news is we all are perfectly capable of testing out these theories for ourselves and information is power as we share the Divine ideas at the speed of light on the Internet. The beautiful thing is that our Divine radiating sun is free for everyone. Makes one understand that Divine minds really are at work. Kim Caldwell is the author of the Solfeggio Switchword Meditation Series. Click here for more articles by Kim Caldwell!